especially for BASS applications, as it has an optional thumbnail generator for audio files. 1. All column position/width and sorting settings are saved for EVERY application and/or you can choose to ALWAYS USE your favourite view mode! 2. Has a very hiqh quality thumbnail mode (that supports much more formats then the default Windows dialog, and display audio files too (!) Taged with ID3v2 and containing a SESC frame. 3. Drag&Drop for files/folders (you can drop files from Windows explorer onto the window too). 4. In thumbnail mode if pictures are found inside the folder, the folder's neme is above the thumbs, if no picture is found it's on the center (looks very good). 5. If bass.dll is found thumbnails are generated from all audio files (all file formats that BASS actually supports, or there is plugin loaded for the particular format) so is particularly usefull for applications using BASS. NOTE: It's not enough to copy a bass.dll into the folder, Filesystem Dialogs expects a fully initialized BASS state. 6. And the most important: Has a customizable favorite folders list on the left, which serves you with one easy click always! .dll and pascal wrapper included, it can be used with any developing environement as it is using a simple stdcall with a structure, please read the docs, very simple. An update is now downloadable. There was a 1 line mistake in the code that made the "with BASS" thumbnail generator just fail, but it's fixed now. The package is still beta though. The first, V1.1 fully working release is available for download. Please post your suggestions, enquiries if you mind! Oh yes, and whoever translates the FilesystemDialogsDefs.pas to other languages (leave out the Delphi TComponent layer and it's just a couple of lines) can use the lib in his projects freely (as I don't know any other language then Delphi, only a little C-reading ). An update V1.2 is available! (docs on OPENFILENAME Structure) which emulates the same comdlg32.dll functions (though no Unicode support yet! The "W" functions call the "A" functions internally! ), so now everyone can use this lib, just redirect the calls here! Has a couple of bug fixes and enhancements too as usual. No one even comments you on your work :/ , well, for what its worth. Thanks for this , I think it will be quite usefull in my app , keep up the good work! So now something important comes to my mind! Network files (you know starting with "//3DELITE/...") cannot be accessed so far! In theory use the default Windows dialog in this case (top right corner - one click)! I am still looking for any info on how you get on with it! Fixed a major bug in audio thumb generator (that should crash always but it didn't fooling me it's working. I was accidently using the same object from within a sub-procedure and freed it inside leaving the parent procedure without it. This also resulted some major memory leaks. Now it works even with many audio files.) Also the audio thumbs now are generated properly for small audio files to (samples) and also the little space at the end is fixed, now the sample graphics runs from start to the end as it should. The library had been updated with many BASS related improvements. The browser displays album covers as thumbnails. The balloon hints have an option to pin them and a play button (the play button will appear for file types defined in Settings). Balloon hints on lister with album cover thumbnails. "Sticks" preset dimension, the proportions can be freely specified in Settings. Option in Settings to purge the thumbnail cache entirely from the computer, displays space usage etc. For details see the home page. Works on Win98(SE? ), don't now if works on Vista. If somebody could try, and inform us it would be helpful. Fully open-source and free, with a registration option. The only drawback is there is no unicode support. There is also an alpha state system wide patcher app. all files double in the Filelist. When close my app then my app crash and Delphi 2006 crash with it. i thinks you have the problem not BassVis. New 2.1.1.5158 Beta version is available for beta testers (debug version, creates crash logs, not suitable for releases), but is fully unicode enabled! The crashes had been probably fixed, but testing is needed until a stable release. Please report the crashes if they happen. New (stable) version of Filesystem Dialogs is out. The most important update is full unicode file name support. Note: The licenses are the same as with BASS. You need a BASS license also if you use this component (if you have a BASS license already then you need just a Filesystem Dialogs license). If you like the library then check out the Vanga Rengi Mangaro project, that is a patcher that patches all processes to use Filesystem Dialogs instead of the default Windows dialogs (very cool). Tha package has been updated! The newest build supports both BASS 2.3 and 2.4. The package has been updated with a VC++ example. The component is now available in Win64 flavour too. Audio preview has been enhanced, (there seems to be a bug in Graphics32 which resulted a little pixely display) the quality is now 100%. 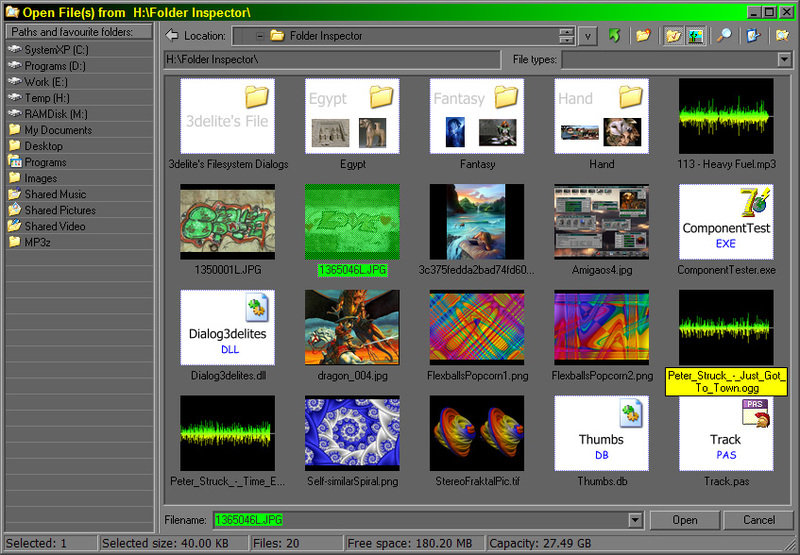 Video preview is now implemented using xVideo. Didn't post for a long time in this topic... The library has been updated recently, all the thumbnails, including audio thumbnails are now fully alpha transparent, option to browse virtual folders, like network drives, are also implemented. The audio thumbnail's colors are fully customizable, dimensions too, the browser dialog can be integrated into a panel, so the window you see in the picture can be part of a window (an app. 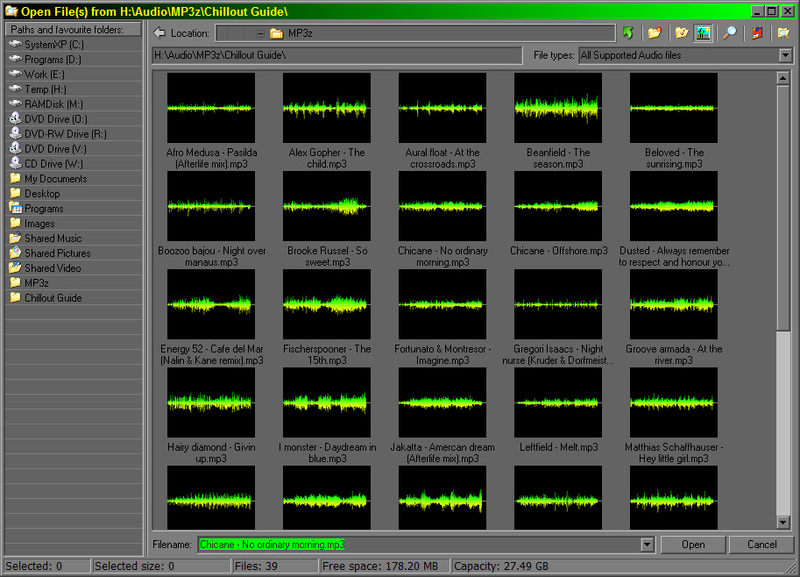 ), the audio thumbnails can be cached, which means nearly instantaneous displaying of them. For audio related apps. this sample thumbnail view can be quite cool, previewing the sample audio files when browsing them. If you already use BASS, the library makes use of BASS automatically, meaning if you have a BASS plugin loaded for a particular format, audio thumbnails are generated for all those file types as well. Optionally "on select" notifications are available, the displayed files can be played when hovering above them in the balloon window.